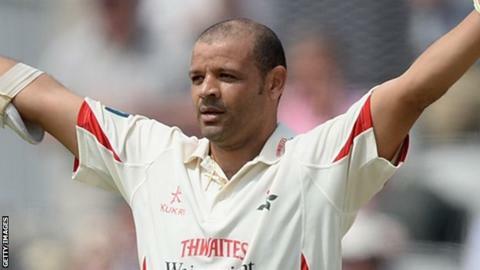 Lancashire's former South Africa batsman Ashwell Prince is to retire from cricket at the end of the season. The 38-year-old initially chose to quit at the end of last season, before reversing his decision last November. "There comes a point where family becomes more important," Prince said in a statement on the the club website. Prince, Lancashire's leading run scorer this season, was crucial in helping the Red Rose county to promotion to Division One. "I wanted to come back and get the side back up to Division One and that's been achieved," added Prince, who played for Lancashire in six of the last seven seasons. "Not only that, but we've won the T20 Blast which was a bonus. The whole squad have been excellent and I've absolutely loved my time at Lancashire." Notably this season, Prince hit 261 against Glamorgan in a 501-run third-wicket stand with ex-Proteas team-mate Alviro Petersen, the third highest for a third wicket partnership in first-class cricket history. Prince also made 119 international appearances for South Africa - playing in 66 Tests, 119 one-day internationals and one Twenty20 international - after making his debut against Australia in February 2002. He had a spell with Nottinghamshire in 2008 and three separate stints with Lancashire as their overseas player in 2009, 2010 and 2012. Having played his last Test in December 2011, he returned to Old Trafford as a non-overseas player under the Kolpak ruling in 2013.